She is a screen goddess of the 1920's. She is flawless, pristine and perfect in both complexion and demeanour. She is a porcelain beauty with features that reflect a glamorous fascination with the orient. She is the epitome of elegance - luminescent and glowing yet velvety smooth to touch. She is a modern girl, infatuated with the world of old Hollywood glamour, flim noir and decadence. She is Napoleon Perdis' China Doll. 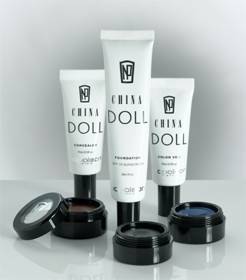 The China Doll capsule collection includes a foundation, concealer, color veil and three gel eyeliners to achieve a perfect porcelain complexion. The China Doll Foundation is a lightweight, long wearing luxe liquid formula that combines the benefits of a self-setting foundation and powder in one. The longwearing, water resistant China Doll Concealer banishes unwanted blemishes and a cream based all over Color Veil is designed to instantly transform skin with a translucent touch of color. The China Doll look is completed with a long lasting gel textured Eyeliner that defines the eye to perfection. This quick setting and long lasting formula is hypoallergenic and glides on effortlessly for ultimate control and comfort. The China Doll Eyeliner is available in Equinox (black), Heaven (blue) and Earth (brown). Gemma Sanderson, winner of Australia's Next Top Model, was transformed into Napoleon's vision of a China Doll and embodies this look in the accompanying creative campaign. As part of her Australia's Next Top Model prize, Gemma was flown to New York in 2005 to shoot the China Doll campaign with Napoleon Perdis as the head makeup artist.